What constitutes a good Canon travel camera bag in your eyes? Technically speaking, this is not a travel camera bag made by Canon. But, since this is the Canon Camera Geek web site, I cover equipment and accessories made for Canon cameras and that's how I titled this post. The bags worth looking at that Canon makes are primarily "shoulder bags" and there is a link for information on them on the left. 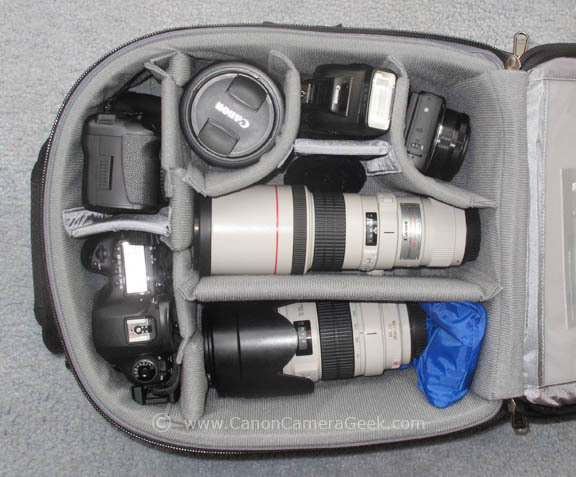 This is my preferred travel bag loaded with my Canon equipment that I use for flying. Included are my Canon 5D and 5D mark III camera bodies, Canon 24-105 f/4, Canon 270EX II Speedlite, Canon G1X Mark II Camera, 400mm f/5.6 and 70-200mm f/2.8 L lenses. This travel case is the Think Tank Airport Airstream, stuffed with the equipment mentioned above. 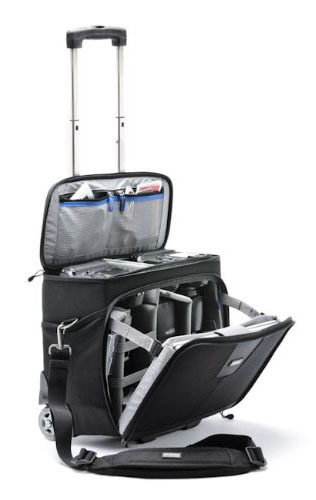 Although you can use a shoulder strap this bag is not for carrying your camera equipment during a photo shoot. I put a lot of thought and research into buying this bag, using YouTube reviews, Amazon.com Reviews, B+HPhoto-Video, as well as several company websites such as Lowepro and Think Tank Photo. I insisted on a travel bag that would carry all of my cameras and accessories and still fit under the airplane seat, if needed, in the event of an overcrowded flight and full overhead carry-on storage bins. No doubt, this is a very specialized bag for airline travel. If you were looking for something else, use the search box at the top of this Canon Camera Geek post, on the right. There is a lot of other useful information here on this site, on other types of camera bags and backpacks. I hope it helps! There is another camera bag design I really like for traveling on the trail or for an event where you want to move fast and access your camera gear quickly. 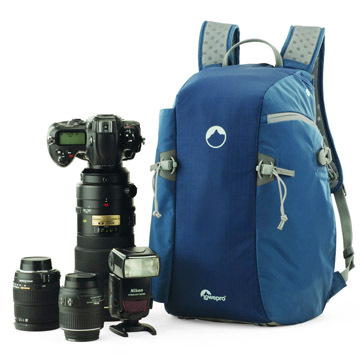 There are several variations of this design called "flipside" by Lowepro. They are great for sports and wildlife photography where you have situations that change rapidly, you need mobility and quick access to a variety of lenses and camera bodies. There are some great videos to watch on the Lowepro-Flipside web site, giving you a good idea on what gear can fit inside, showing you how they work out in the field, and their portability and comfort. You can buy them from Lowepro's site or get them a whole lot cheaper though on Amazon. Before you get wrapped up with all of the choices, make a written list. Most photographers are visual learners and thinkers so having a written list in front of you helps you organize your thoughts. Write down what equipment you want camera bag to be able safely carry as a minimum and the have a second list of extra gadgets you'd like to include if you had room. Then determine if your travel bag is going to be a carry-on for airline travel, something that you can use during a shoot, or just for transporting locally from your home to a photo shoot. That will help you decide if you want a Canon travel camera bag for 1) airline travel, 2) quick-access shooting, or just 3) local transportation of your equipment. Good luck with finding the right Canon travel camera bag for your needs. Have a blast with your photography! 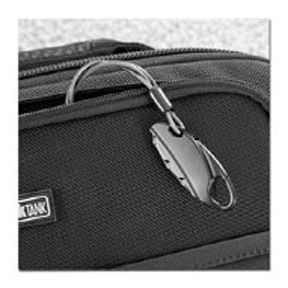 Think Tank is the name of the company that makes the travel bag I purchased. As a special treat for the raders of this page, you can get a free gift if you order from them using the link below. 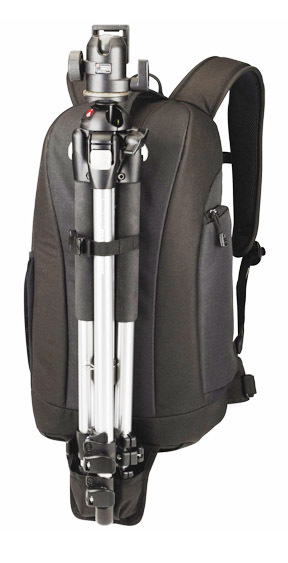 This Travel camera bag is designed like a backpack and comes with tripod holder. 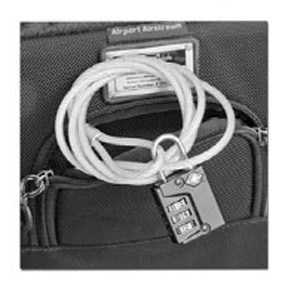 The travel bag comes with locks for the main compartment, the overall case itself, as well as a lock for a laptop computer. 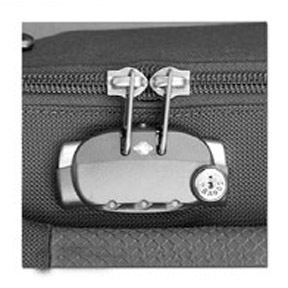 Travel camera bag lock-3 for the laptop computer.